Unlike her two "sisters", Soyogi has little experience with personal interaction, especially romantic ones. 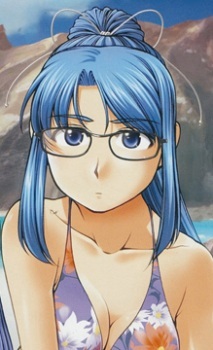 She often seeks solitude, more than her priestess siblings, but through her meetings with Nagi, she learns quickly how things work, even if she's got a bad habit of literally doing stuff from magazines or TV shows without thinking of what she's actually doing. Soyogi is physically strong, probably due to her penchant for excercise and training. She's also quite adept at playing the Sanshin, an Okinawan string instrument vaguely similar to a banjo.